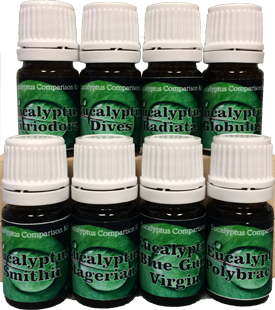 Includes full 5 mL bottles of all 8 of the Eucalyptus oils we regularly stock and sell. It's a perfect opportunity to compare all eight varieties and choose your own personal favorite. The kit contains.... Citriodora #327, Dives #334, Globulus #337, Blue Gum Virgin #341, Polybractea #344, Radiata #347, Smithii #351 and Stageriana #354.